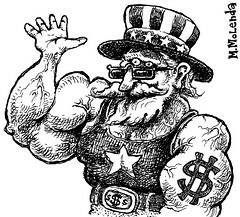 Online Freedom and Uncle Sam. One of the memorable Privacy and Surveillance discussion I had to comment on is this issue about American authority’s arrogant control over the countless number of online sites. As one of the minor Internet users, I was plainly shocked to hear that any foreign-based sites with the domains under U.S. government control can be seized any time. .Com, .net, .org, .biz, and so on are all globally popular domain names. In the particular incident reported in the article above, Bodog.com was seized, potentially because the registry was an American company (VeriSign) and probably had many gambling participants within the U.S. It doesn’t matter where the site owners are, or where they registered the domains. The fate of all the online sites is in the government’s hands, or is it not? Considering the hacker group Anonymous’s recent massive retaliation on government websites for Megaupload raids and Wikipedia’s protest, it seems that the problem is getting nowhere. I’m sure the Internet users who invested money to the site (s) are angered. There would have been an incredible number of people involved, since in case of Megaupload, it is actually “Mega”-popular. Overall, the issue can simply bring out political debate. Freedom is achieved by great expense. However, it certainly is dismaying to know even the freedom of speech can be seized from us any time soon. Thanks to Alex for the discussion. His blog post on the article can be found here. I’ve been trying to make sense of this issue too. I like the way you frame it as arrogance on the part of U.S. government. Why is it that citizens in other countries can be held accountable for violations of U.S. law without committing a crime in their own country? My limited information and understanding prevents me from having a clear answer. But I think that as the U.S. remains the biggest player in the world economy and so much of the commercial internet traffic runs through U.S. companies and facilities, they feel they can call the shots for users every where. I’m glad I’m not the only concerned by these developments. Imagining the US government taking over the world wide web is just discouraging. One of the problem is that the companies in collaboration with the US government are also responsible for this outrageous issue. If you think of it another way, other economically strong powers can rule over the Internet in place of the US. I wonder who is the next arrogant country online?